"I really enjoyed the atmosphere and diversity of going to school Downtown in a big city. Being from a small town, this was a desired change of pace for me. There was (and still is) always something going on Downtown or in various parts of the city." What factors made you choose Point Park University and its human resource management program? First, I obtained an associate’s degree in resort and hotel management from Pierpont Community and Technical College in West Virginia. Although this degree interested me, I knew that I did not want to continue onto a bachelor's degree and work in that field my entire career. The field of human resources had appealed to me for a while, but Pierpont and their sister school, Fairmont State, did not offer a degree in it. 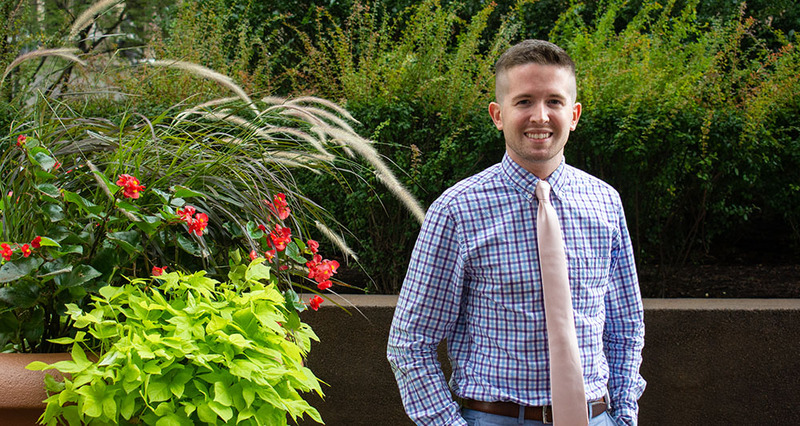 Knowing that I wanted to move to a city as soon as I graduated college anyway, I investigated Point Park University’s HR management program. How did your HR degree help you land the position of physician employment coordinator for UPMC? The physician employment coordinator role is under the human resource information system wing of the HR department. My degree in human resource management appealed to my managers because my role as physician employment coordinator is for someone who has an HR degree and wants to be exposed to various parts of the field. Even though our team is under HRIS, we work closely with the payroll and talent/acquisition departments. What was your favorite HR class and why? Labor Relations. This has always been one of my favorite parts of HR and I hope to incorporate it into my career long term. HR employees have such an opportunity to improve their company's work environments if they focus on positive labor relations. It is interesting to see what motivates employees or pushes them to leave a company. How did you balance working full time with college? I was fortunate to find a job as an administrative assistant that I worked at during the day and then attended class at Point Park during the evening. Working nine to five and then having class three to four days per week was a challenge, but I made it work. This experience really taught me to focus on one thing at a time to not get too overwhelmed. While I was at work, I only thought about/focused on work. During the evenings while at class or studying in the library, I only focused on school. It was important for me to make sure not to cross the two. What’s your favorite Point Park memory? I really enjoyed the atmosphere and diversity of going to school Downtown in a big city. Being from a small town, this was a desired change of pace for me. There was (and still is) always something going on Downtown or in various parts of the city. Advice I would give to anyone is don’t hold yourself back. If you want something, make it happen. You are your own biggest enemy. My mom preached this to me as a child, and I thought she was crazy. As I got older, I realized she was right. Everything I have tried, I have succeeded at with flying colors. Yeah, not everything always worked out the first time — but I never stopped trying. Make it happen.